Turn to Marcy’s Automotive for all of your auto repairs and vehicle maintenance needs. Marcy’s Automotive has been in business for almost 40 years and we still love what we do. In 1979, Marcy's first came into business in Indian Hills and moved to Evergreen in 1982. In 2009, our second location began its journey in Bailey. Providing automotive repairs and maintenance services is only the "what" of Marcy's Automotive. For customers across the Denver foothills, including Conifer, Bailey, Evergreen, Pine and the surrounding areas, our customers are the "why". Evergreen has a large Subaru and Jeep population that depend on Marcy’s Automotive’s repair and service expertise. We know our customers and what they need. More importantly, we know what they don't need. They don't need another shop in the area telling them that something is wrong when it isn't, and they don't need to worry when they bring their vehicles in for service. Marcy's Automotive is a family-run business and our customers are a part of our family. The Marcy's family has been extremely involved in the communities of Evergreen and Conifer. 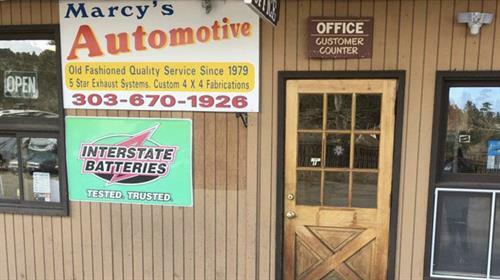 As a member of both Chambers, and having donated to our schools, communities and many social projects, Marcy's Automotive is proud to have serviced our communities with the highest of quality service. We are located 4 miles south of downtown Evergreen on Hwy 73, on the right hand (West) side.